Soul Friend is when you have a special person to look after. Play with, read books with, laugh together and sit with them in mass. The Holy Faith Sisters brought this Irish Tradition to St Pius X School. Every Student Has A Soul Friend we usually have a senior student with a junior student. Sometimes a senior student might have to soul friends from the junior school. We have shared morning teas and look after each other. My Soul Friend is Tupua he is 6 and he is in room 4. This year i will help him to achieve lots of learning. like about bots-wanna or more country like usa. On Friday me and my Family we went to the Beach again For a Walk it was kinda fun then i played at the playground there were many Kids at the playground. but l went to climb that steel Chamber l climbed up there then it was kind of small for the little kids so i decided to hop off because l was a big person then next i took off my sandals then i walk into the water with my bare feet Because it was nice and cold at the water and by way l went to St Heliers Beach there were not many people there but when u go to mission bay there is heaps and heaps of people there are mission bay beach. after that me and my mum walk to St Heliers ice cream Shop there ice cream were kinda big i had Goody Goody Gum drops and my mum had Cookies and Cream. 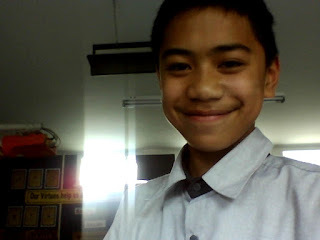 Greetings everyone my name is Richie and i'm a year 8 student in room 7. I had a great experience in room 7, and I also made new friends , next year I am going to college, the college I am going to is called selwyn college, so this year I am aiming to reach my goals, so I can get into the college and also I can become what I want to be.